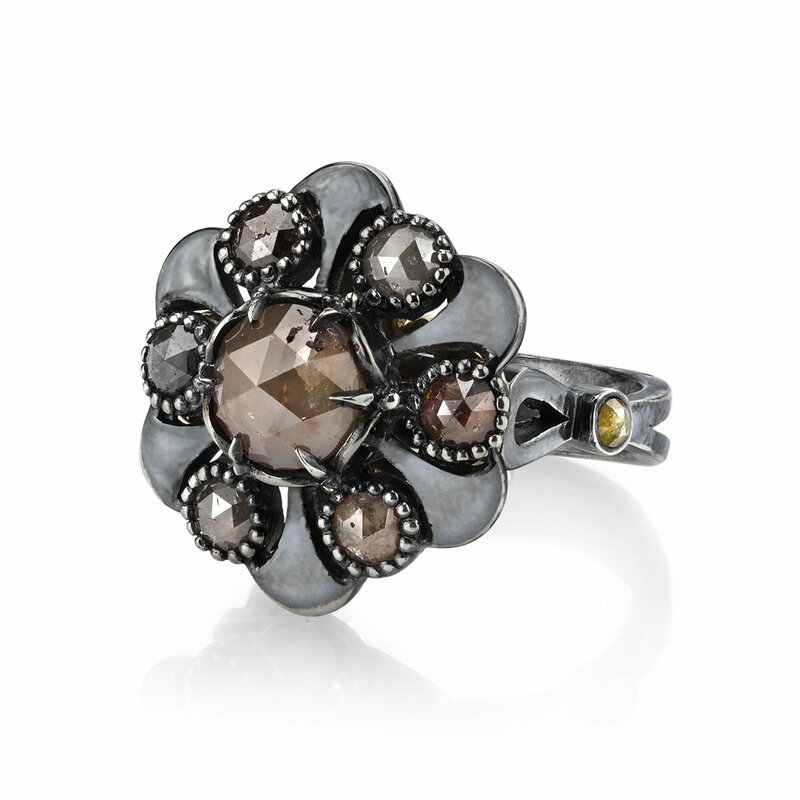 A unique take on the floral trend, this ring features Organic Silver 'petals' adorned with Rustic Diamonds. The cool tones of the Organic Silver perfectly complement the Earthy Rustic Diamonds, creating a work of art that is unmistakably Michael Barin. If you love florals but are tired of traditional, coquettish pieces then this is the ring for you. Organic Silver does not contain any added alloys that could compromise the strength or quality of the piece. When asked why he prefers Organic Silver to "regular" silver, Michael says, "it is a form of environmental conservation - we save the planet while creating wearable works of art." 3.29 Ct Rustic Diamonds set in Organic Silver and accented with 18 Karat Yellow Gold. This ring is about 1in long and 1in wide, and can be sized anywhere between a size 4.75 and size 8.75. Regarded in folklore as "Stones of Wisdom," sapphires honor the higher mind and have been worn throughout the ages for protection, good fortune, and spiritual insight. Pink sapphires are believed to be particularly useful for assisting the emotional body through the transitions of life, while soothing the heart and aligning it with the mind. Interestingly enough, Calla Lilies are a symbol of resilience and perseverance, since they are known to survive frigid temperatures and regrow after they have been cut from the Earth. Add almost twelve carats of pink sapphires and you're ready for anything that life throws Inspired by the beauty of the Calla Lilies, this dazzling pink sapphire ring is adorned with 11.75ct of sapphires, accented with .31ct Diamonds and is set in 18 Karat Rose Gold. The ring size is a 6.75 and can be sized one size up or down.